I would have posted this Monday but we had no internet service. It finally got restored yesterday. Amazing how dependent we've become on our internet, isn't it?! The problem is, these are 9" blocks so as shown this layout would finish at 56" by 63". That's a little skimpy to be practical. 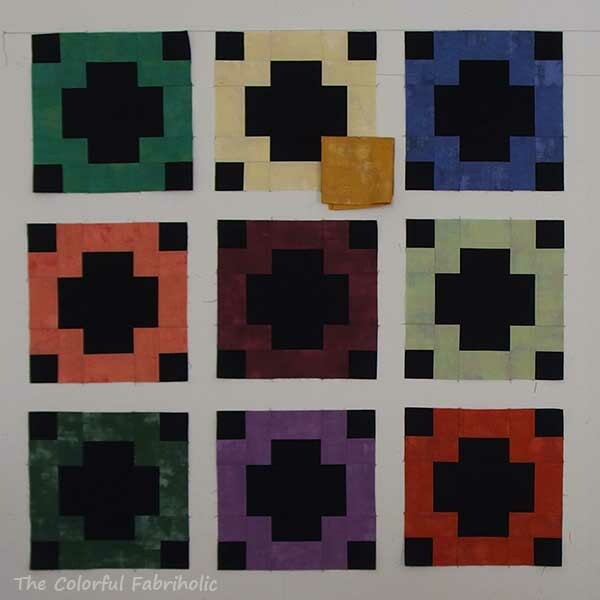 I don't have any more of the colored fabrics left so I can't make any more blocks in these colors. 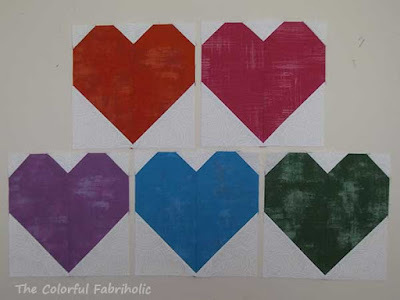 One option would be to add a third color to the mix and make more blocks. 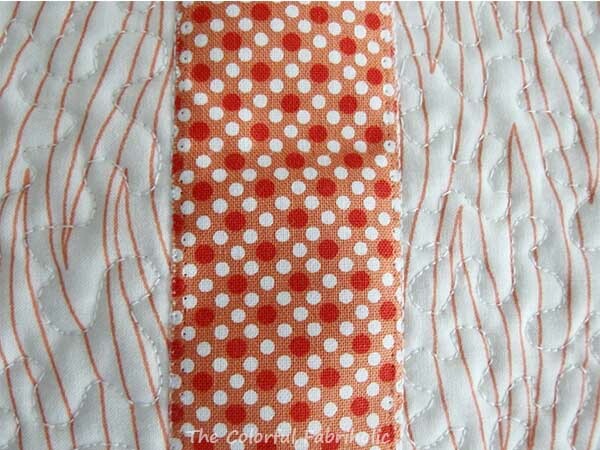 I have plenty of the low volume fabrics so I can make the new blocks look consistent with the existing ones. Here's an EQ rendering of what it would look like with teal blocks added. 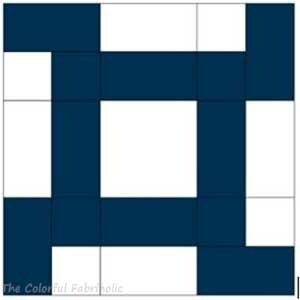 This would be 63" x 72", a better size for a lap quilt. 3 colors, 9" blocks, 63" x 72"
2 colors, 10-1/2" blocks, 63" x 73.5"
By making the blocks larger, the proportion of colored triangle to low volume background changes. 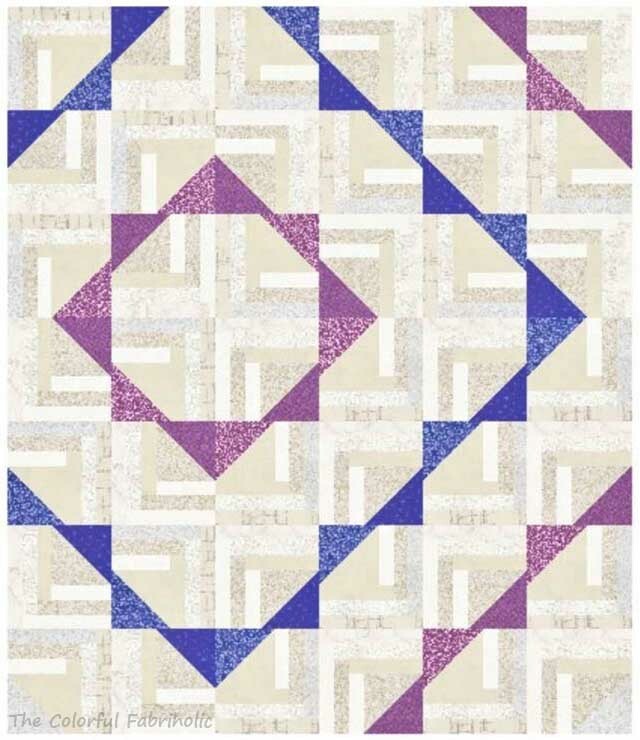 In the original layout, you can see that the triangles overlap by half of their base: 9" blocks, 6" triangles, 3" overlap. 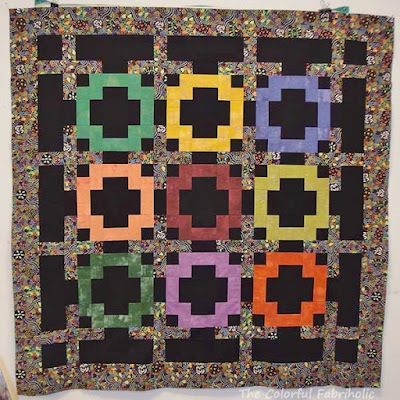 The colored rings are strong diagonals. With the added logs, there is much less overlap. 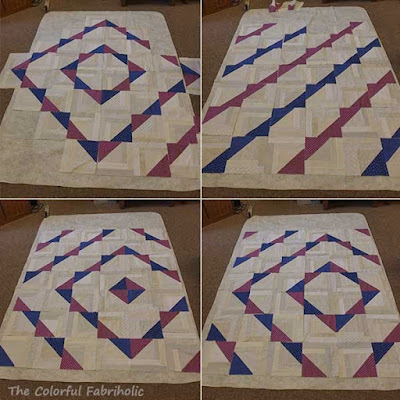 10-1/2" blocks, 6" triangles, 1-1/2" overlap. This makes the triangle points stick out more, like pennants. It also creates more negative space. So, which option do you like and why? Not Christmassy, but that's okay. It's a gift, a monogrammed pillow, and the recipient's favorite color is orange. It's actually one of two similar gifts; this one is finished and the other is underway. 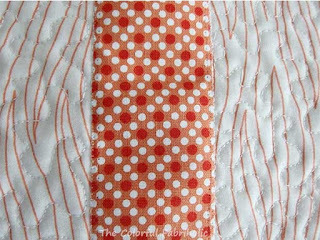 So I can count out the fabric used for this one in my stash report this week, but I can't count out the other one yet. So, stash report for this week: nothing in and 2-3/8 yards used. I'll total up the June numbers next week. Check out other stash reports at Patchwork Times. I hope you'll come back for my 12 Days of Christmas in July Blog Hop post. I'll have pics of my monogrammed pillows and a tutorial for making them. It's never too early to get started on hand made gifts! Look What Alycia Did with Cut and Shuffle Blocks! So original! I never would have thought of a layout like this, but it works beautifully. Those blocks just seem to dance! 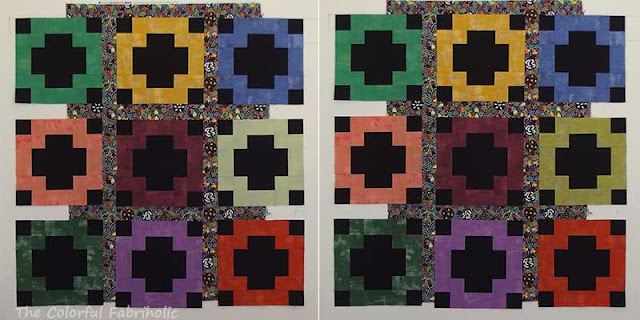 Alycia's layout leaves lots of space for her gorgeous quilting; check out those eagles. 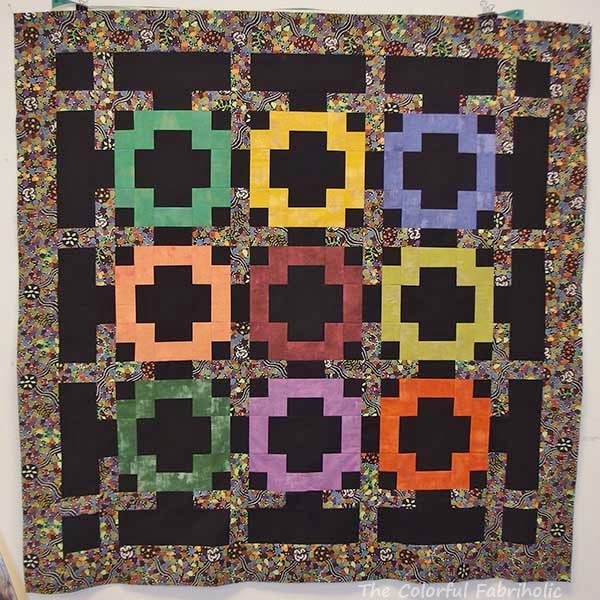 She'll present this quilt to a veteran as a QOV. Thank you, Alycia, for sharing your inspired use of Cut and Shuffle blocks. 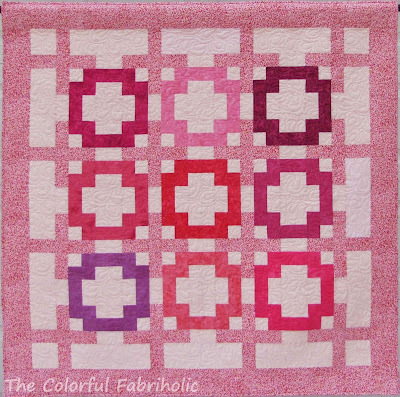 The Labyrinth block is one of several blocks featured in Cut and Shuffle Quilts which are made with my Block Mama method. 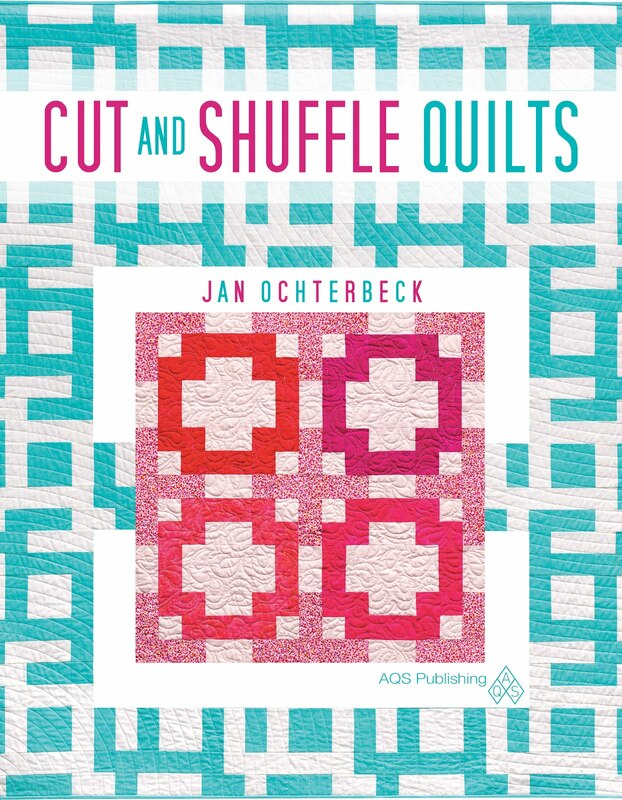 Cut and Shuffle Quilts is available from me (leave a comment) or from AQS or Amazon (no affiliate link). Linking up with Confessions of a Fabric Addict. 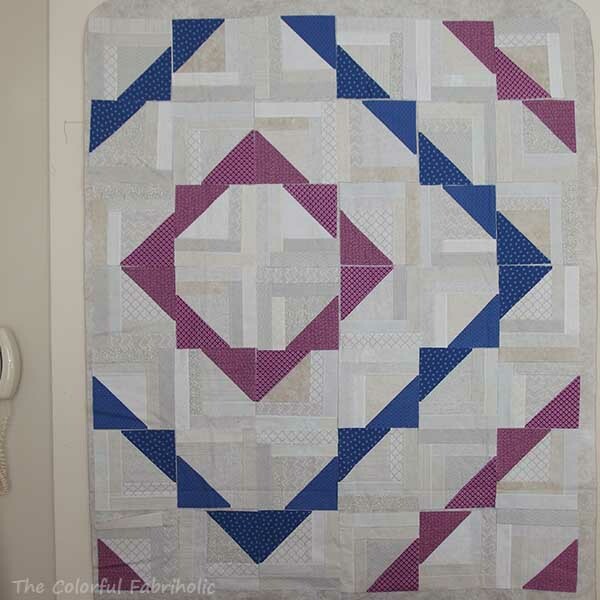 I'm whooping today for Alycia and her finish using blocks from my book! So Much Accomplished at Camp! My friend Chrissy invited me to a private retreat at a camp where she was the supervisor for the weekend. 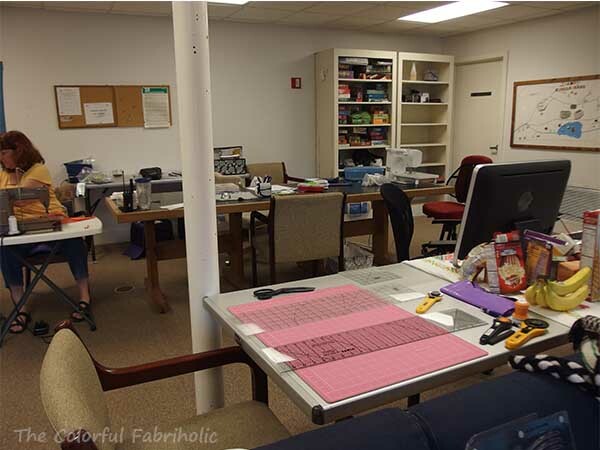 The supervisor's quarters are spacious, and between her official duties, she has time to hang out and sew. Her sister, a scrap-booker, was also there, so we had craft stuff all over the place. I took several projects along and sewed all weekend. Friends, food, sewing, what could be better?!!! My main goal was to get PAussietivity pieced to a flimsy. Done! Here it is hanging on our makeshift design wall at camp. PAussietivity flimsy, 60" x 60"
I made it exactly like the original. I love that Aussie print, and I wish now that I had made the outer border 6" wide instead of 4" wide, to show off more of that print. Oh well, too late now. But it's done! 6 yards used. I also worked on a UFO that was previously kitted up. 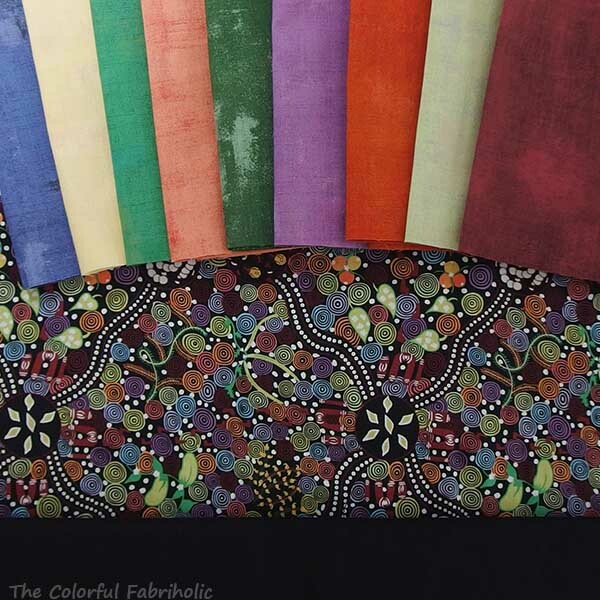 Several years ago we had a challenge at STLMQG to choose a magazine image as inspiration, then your swap partner would select some fabrics based on that image for you. I no longer have the image, but my partner certainly nailed the inspiration. Here's the flimsy I was able to finish at camp. The fabrics from my swap partner are the large quadrants in the blocks, plus I added a few more prints from stash. 3-5/8 yards used. This will make a nice baby quilt or donation quilt. Any suggestions for a name for it? UFO flimsy, 44" x 44"
I forgot to photograph the last layout at camp, but I rolled the whole thing up to bring it home and hung it on my design wall this morning for a photo. I like this layout best. I don't have any more of the colored fabrics. If I use only these blocks, the resulting quilt will be 54" by 63" but I'd like to make it bigger. To make more blocks, I'll have to introduce a new color to the palette, maybe teal, and come up with a layout that will work. I have plenty of the low volume fabrics left so I can make more blocks that are consistent with the existing ones. I'm going to pack this project away - with notes - until the next sew-in or retreat. 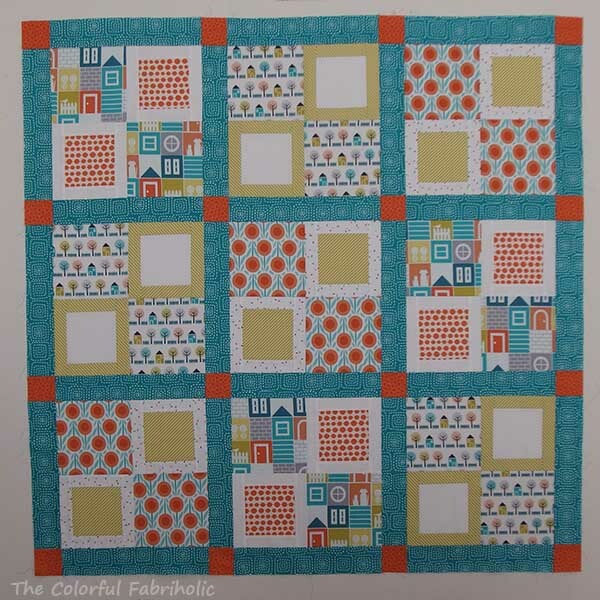 Then I'll find two suitable teal prints and kit up pieces for more blocks. It was great to get away at camp for the weekend. I came home yesterday afternoon and wished my DH Happy Father's Day. He's so thoughtful - he went grocery shopping and made congri for dinner so I wouldn't have to cook when I got home. Then I found that we didn't have any internet connection. Ugh! No internet, no U-verse TV, no house phone. After dealing with customer service for an hour last night, we ended up having a technician come out today. He replaced wiring, outside box, basement box, and modem, reset everything, and now - finally! - I'm back on line. OUT this week, 9-5/8 yards for the two flimsies finished at camp. I'll total everything at the end of the month and see how close to breaking even I am for the year. If I can end the first half of the year at net zero, I should do well for the rest of the year. By now you've probably heard that the Orlando MQG is making quilts for the victims & families of last weekend's shooting, info here. These blocks are already in the mail and on their way. Not a complete rainbow, but hopefully these will help. In other news, I'm excited to announce that I'll be participating in the 12 Days of Christmas in July blog hop being hosted by Sarah of Confessions of a Fabric Addict. More than two dozen bloggers will be posting about Christmas gift or holiday themed projects. I'll be sharing monogrammed pillows for gifts, plus a tutorial for making them. I'm scheduled to post on July 21, and I hope you'll visit all the stops on the blog hop, July 14-25. Much better. I'll use the new light olive and save the mint green block for something else. I also got all the sashing and border parts cut so I can pack them up to take on retreat Friday. I plan to get this top completed this weekend. I made a replacement block for PAussietivity* using the mustard Grunge and I'm pleased with it. I put the blocks back on the wall on top of the Aussie fabric just to see how the sashing will look, and it works well. My STLMQG bee, Sew Bee It, had a Sew In on Saturday. Marie provided the fabric for the wonky stars and the instructions, and asked us to raid our scraps and make two blocks. I was able to get one block made, and traded patches with a friend so I made the other block yesterday. I have leftover duplicate pieces that I'll give to Marie so she can scatter them around in other blocks to help unify her quilt. I also got some more of the LC Triangle blocks made at the Sew In, but I still have more to finish. I'll finish them at camp/retreat this weekend. My priority for this week is to get all the sashing and border parts for PAussietivity cut and kitted up to work on at camp. I hope to get the top completely assembled. I'll take both PAussietivity and LC Triangles to camp plus a UFO that's already kitted up, so I should have plenty to keep me busy. Linking up with Judy at Patchwork Times; check out all the design wall inspiration over there. Much better! Against the black, and there will be black/multi print in the sashing, the darker color is much better, not so high-contrast. But against the black, it still reads as one of the lighter colors here, which is good for the overall balance. I have a three-day retreat coming up next weekend. My plan is to get the replacement mustard block made this week, and the sashing and border pieces cut. Then I hope to get the top completely pieced at camp next weekend. With a little luck, I'll be able to count out all the fabrics for this top. With encouragement form blog readers - thank you all! - I decided to leave the quilting as is, organic wavy vertical lines every 1-1/2 to 2" and curvy diagonal lines between the plus motifs. This quilt is destined to become a gift. It started as bee blocks for my STLMQG bee, Sew Bee It. Thanks, girls, for making blocks for me! 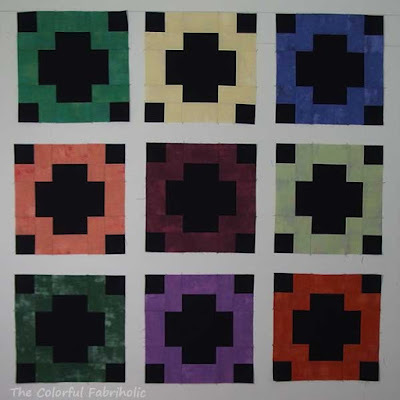 The blocks were so addictive, I just kept making more, so it turned out to be a nice sofa throw size, 60 x 75". If you're interested, here's a tutorial for making the Dancing Plus blocks. These little blocks finish at 6", and there are 120 blocks in this quilt. Some dance to the left, some to the right, and occasionally there's one that's actually straight. The layout is half-drop columns, with a plain piece of background fabric to fill in the top or bottom of a column as needed. I definitely filled up my design wall creating this one! 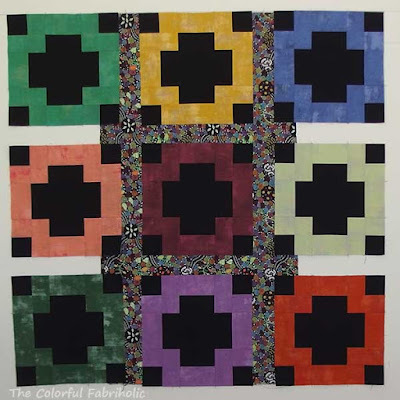 You may remember I'm remaking one of my book quilts, Positivity, with an Australian feature fabric and several colors of Grunge for the blocks. I got the blocks all made, and here they are on my design wall. The colors in the top photo are more accurate than in the blocks. I think the yellow is too light. I need to find a darker mustard yellow, which will still coordinate fine with the print, but won't stand out so much as too pale. Or maybe if I can't find the right yellow, I can find a sky blue. This Saturday my STLMQG bee is having a sew day at a local shop. The shop carries a large selection of Grunge, so I'll have an opportunity to shop for a replacement color then. 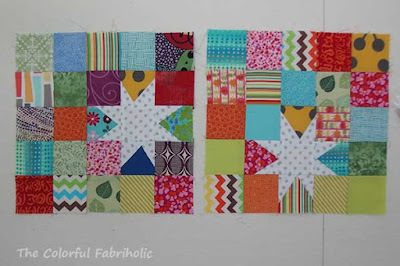 At the sewing event I'll be working on a bee block for one of the bee members and working on my LC Triangle blocks. I think that'll be enough to keep me busy for the day. Then next weekend I'll be at a 3-day retreat at GS Camp. I'm planning to finish cutting everything for PAussietivity before camp, so I can get the top pieced to a flimsy while I'm there. 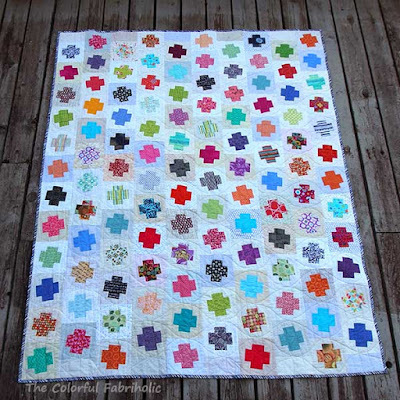 In addition, I'll be participating in the 12 Days of Christmas in July blog hop hosted by Sarah at Confessions of a Fabric Addict. I'm making monogrammed pillows for two gifts, and I'll feature a tutorial for them on my stop on the blog hop. Time now to get busy on Christmas gifts so there's not such a big crunch in December! A Finish? 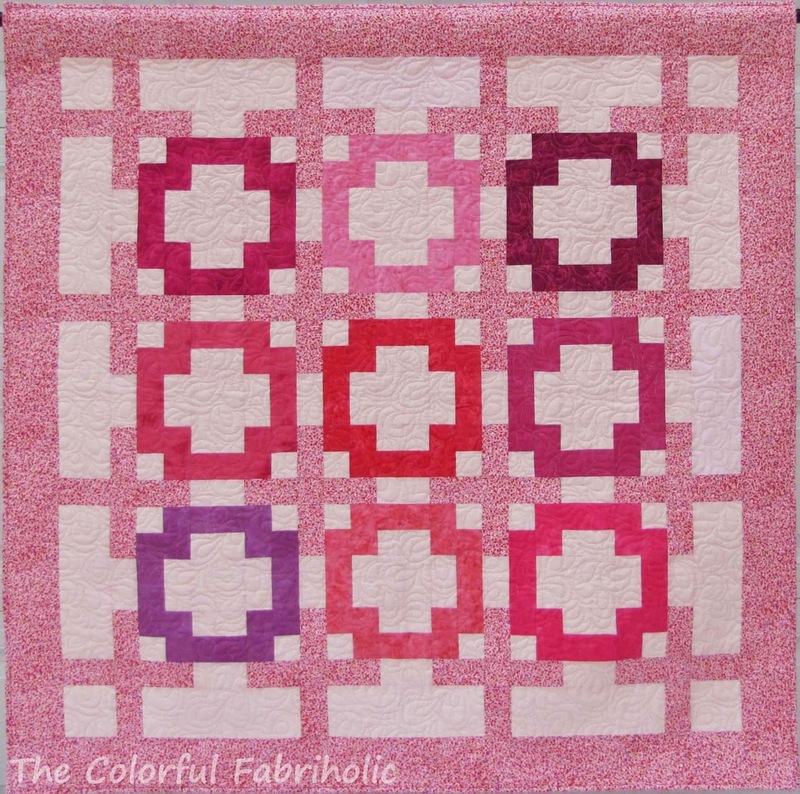 Or Change the Quilting? 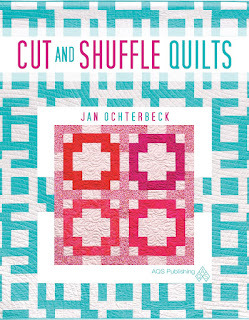 You might remember last week I was debating how to quilt Dancing Plus. I had marked it for one idea, but more experienced quilters cautioned me to attempt only what I could handle on my domestic machine given that this is the biggest quilt I've quilted myself so far. Here's how it looked last week, basted and marked for the first idea. I took their advice and changed my plan. 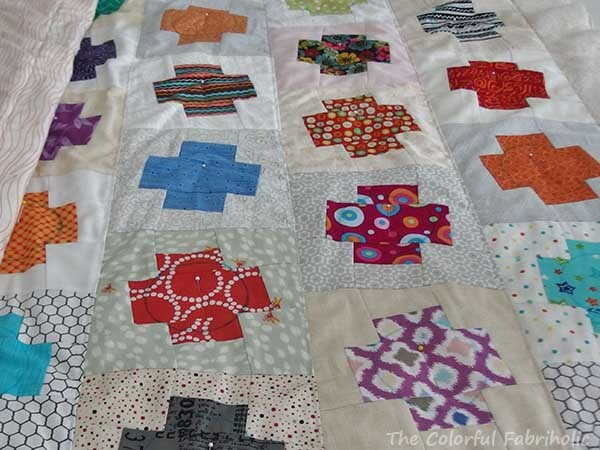 I decided to quilt curvy lines between the plusses. Yuck, big mistake. It resulted in roundish blobs around each plus, and left large areas unquilted. So I spent some time with my seam ripper and took out all the vertical curvy lines. I left the diagonal ones in for the time being to stabilize the layers, and stitched vertical organic wavy lines. The curvy diagonal lines are still there. The organic wavy lines are there, spaced about 1-1/2 to 2" apart, although they don't show up as much in this photo. 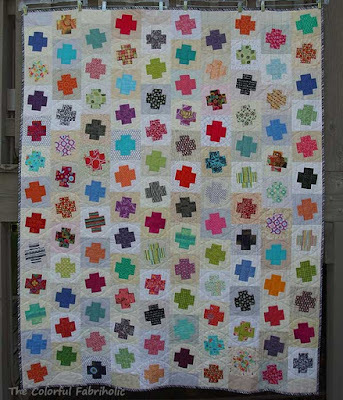 The question is, do I rip out the diagonals and add more organic wavy vertical quilting, or do I leave it as is? 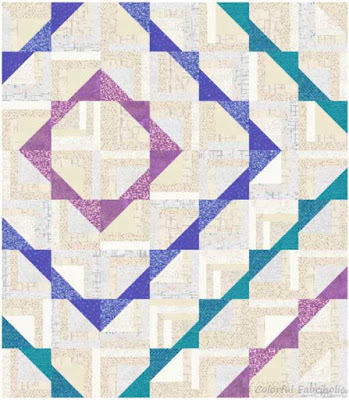 This will be a sofa quilt for an active family with three kids. I want it to be soft, but it will need additional quilting lines over the vertical seams if I take out the crosswise quilting. 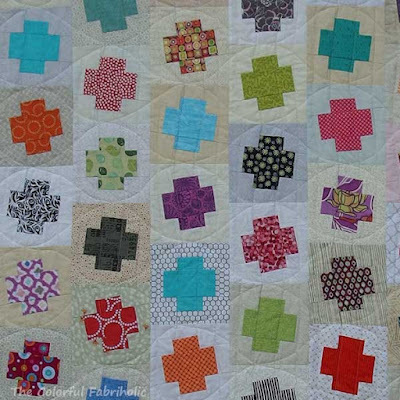 One of my goals this month is to finish collecting the fabrics for my Aussie print version of Positivity from my book Cut and Shuffle Quilts. I have successfully met that goal. Hah! That means fabric has been added to the stash. 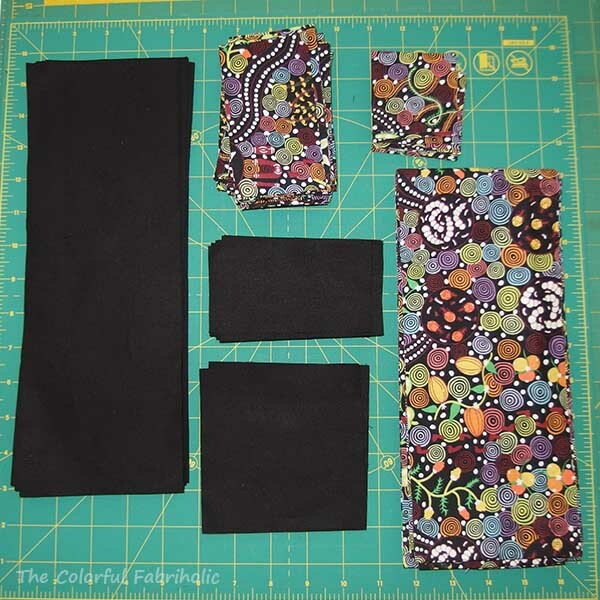 Here's the entire palette, including new Kona black (2-1/4 yds) and six more new colors of Moda Grunge (1-1/2 yds). 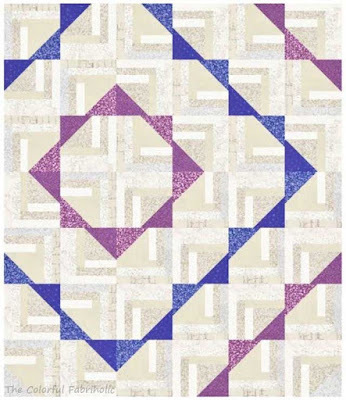 The Aussie print is from M&S Textiles. I do have a finish (more tomorrow) so I can count out backing (1-7/8 yds wide-back) and binding (5/8 yd). So, IN this week, 3-3/4 yards. OUT this week, 2-1/2 yards. The Aussie version of Positivity will be for a class sample to hang in a local shop. There's a deadline, so I have to get busy on it! For your easy reference, here's what the original Positivity looks like.